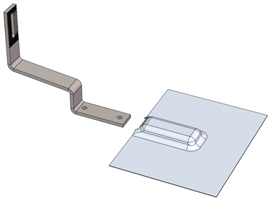 Tile hook is roof attachment for installation on tile roofs. It is the best tile roof attachment solution and comes with flashing. It can be used on flat tile roof and curved tile roof with or without batten installed. It has slots on both the top portion and the bottom plates for maximum height-adjustment. It allows the tile hook to fit tiles from 1.25" thick to 2.13" thick. 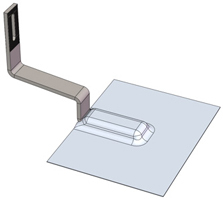 The clearance under the horizontal portion of the tile hook is 1.25” – 2.13” (32 – 54 mm. It fits most of S tile, W tile or flat tile with or without batten installed. Tile Hook part number is 101-019-110. 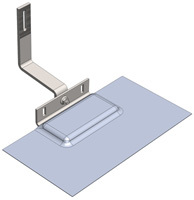 Low Tile hook is roof attachment for installation on flat tile roofs. 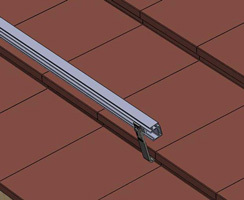 It is the best tile roof attachment solution and comes with flashing. It can be used on flat tile roof with or without batten installed. 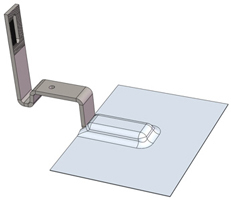 Low tile hook is designed for flat tile or low-profile curved tile without baton. 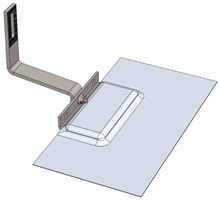 The clearance under the horizontal portion of the low tile hook is 1.1” – 1.5” (29 – 38 mm). 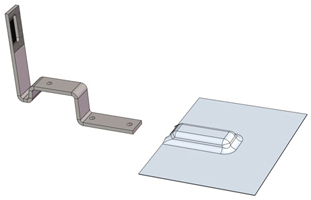 Low Tile Hook part number is 101-019-111. 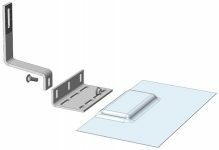 Flat Tile hook is one-piece roof attachment for installation on flat tile roofs. 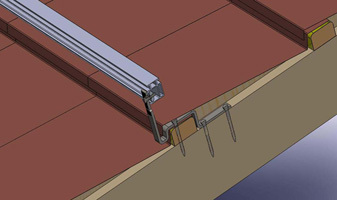 It is the economical tile roof attachment solution and comes with flashing. It can be used on flat tile roof. 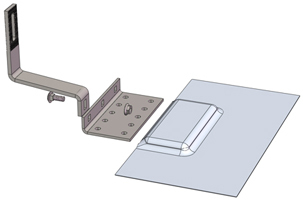 Flat Tile Hook part number is 101-019-112. Complete roof attachment solutions for tile roofs. Steel-Roof Tile Hook is roof attachment for installation on stone-coated steel roofs. It fits all stone-coated steel roofs with different profiles. It comes with flashing. Steel-Roof Tile Hook part number is 101-019-114. Complete roof attachment solutions for stone-coated steel roofs.